All-Ireland champions Tyrone are out of this year's Sam Maguire race after a stunning second-half display from Laois saw them hold on for a prized 0-09 to 0-06 win at O'Moore Park. Mick O'Dwyer's men made little of the wind and rain to send the injury-hit Red Hands packing. Despite Kevin Hughes' opening point, Laois fought back to lead 0-06 to 0-03 at the break. 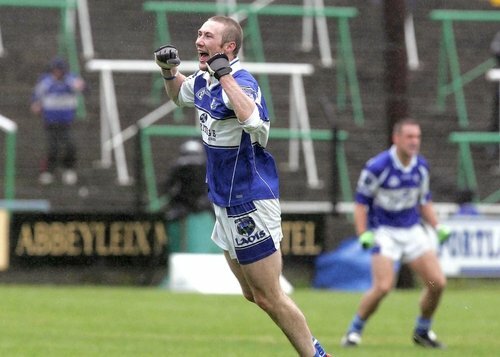 Wind-assisted for the second half, the Red Hands were boosted by the introduction off the bench of 2005 Footballer of the Year Stephen O'Neill but points from Billy Sheehan (0-02) and Chris Conway saw Laois triumph. A barracking wind threatened to disrupt the sides' second ever championship meeting - Tyrone had an easy 3-15 to 2-04 win in a 2004 qualifier tie - but Laois made the better of the conditions to break into an early 0-04 to 0-01 lead. Hughes, returning from suspension, and Sheehan traded early points - Sheehan should have been celebrating a goal but his shot, when one-on-one with Tyrone net minder John Devine, rose tamely over the bar. O'Dwyer's side then tagged on two points in quick succession as Sheehan and classy centre back Tom Kelly fired over. A fourth Laois point followed in the 12th-minute when they turned defence into attack after a Colm McCullagh point attempt had dropped short. The ball was worked down to Ross Munnelly who struck over for a 0-04 to 0-01 lead. The visitors bounced back straight away with Sean Cavanagh haring down the other end and punching over for the second Tyrone point from a midfielder. Laois continued to look a totally different side to the one which was dumped out of the Leinster championship by Dublin as Brian McCormack stretched their advantage, but Tyrone were then denied what looked a certain goal. Referee John Geaney hauled play back for an illegal hand pass, played by Laois midfielder Noel Garvan, as Cavanagh beared down on Fergal Byron's goal. Newry City soccer star McCullagh landed the free to push Tyrone within two points and the Red Hands' luck evaded them once more when Philip Jordan was harshly pinged for overcarrying and Conway converted the free for 0-06 to 0-03. Tyrone boss Mickey Harte played his trump card ten minutes before the break when he put O'Neill, who had been struggling with a hamstring injury, into the fray. Four minutes before the break, Cork official Geaney was at the centre of the action again when McCullagh looked to have been fouled in the square. Penalty claims were waved away as an angry O'Dwyer, clearly incensed by something, ran onto the pitch to exchange words with the referee. The second half should have seen the visitors take the game by the scruff of the neck, but the Sam Maguire Cup holders were strangely found wanting. The half remained scoreless with Hughes, Garvan, Conway and McCormack hitting bad wides, until Munnelly scooped over a 43rd-minute free. Tempers were boiling as the enormity of the game hit home. Owen Mulligan landed a free to rally a tired-looking Tyrone side, but a 59th-minute ball in from Sheehan, flicked over his own crossbar by Devine, cancelled that out for 0-08 to 0-04. O'Neill reduced the gap to three, and after a bad miss by Munnelly and Devine's save from Garvan, McCullagh made it a two-point game. Conway, however, relieved the pressure from Laois' shoulders as Ian Fitzgerald played him in for a 61st-minute score - the last of an enthralling game. 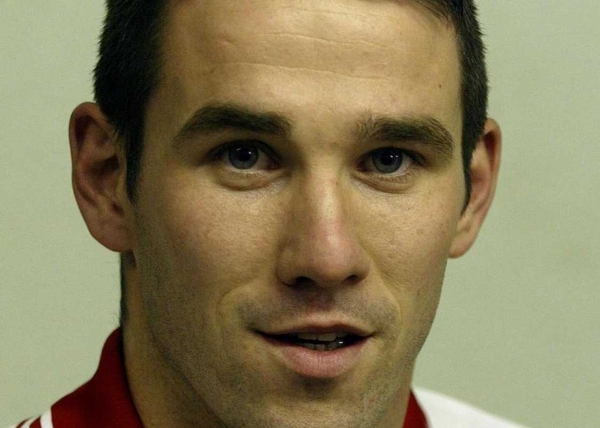 Afterwards, Tyrone manager Harte admitted: 'I take my hat off to Laois. They played with a lot of control in the first half and should have been further ahead. Tyrone: J Devine; R McMenamin, C McGinley, M McGee; D Harte, C Gourley, P Jordan; K Hughes, S Cavanagh; R Mellon, R Mulgrew, E McGinley; M Penrose, O Mulligan, C McCullagh. Laois: F Byron; A Fennelly, D Rooney, J Higgins; P McDonald, T Kelly, P McMahon; N Garvan, B Quigley; R Munnelly, C Conway, B McCormack; B Sheehan, B McDonald, G Kavanagh (capt).